Engineered Spring Hanger for Reformer Furnace in Venezuela | Piping Technology & Products, Inc. Engineered spring hangers shown are being calibrated and tested at Piping Technology & Products, Inc., Houston, Texas Facility. 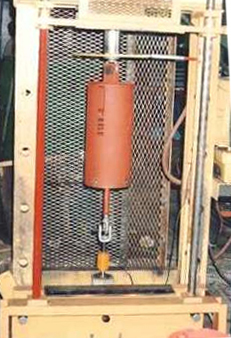 A digital load cell is attached to the hydraulic press that guarantees calibration to the exact loads specified. The spring hanger will support the tubes in a reformer furnace destined for Venezuela. Looking for some new engineered spring hangers? Let us price one for you today!